Lost foriegn tourist asks LAPD Beach unit for directions on the sand. On Monday just past noon, a radio call was broadcast for a stabbing on the Venice Boardwalk. The third stabbing in as many days. The suspect fled, and the victim ran towards the ocean, leaving a bloody trail on the boardwalk heading towards the sand. The officers that responded asked for a Beach capable unit to search for the victim. A strange request… as there is typically always one unit available to respond on the sand. Dispatch responded that no Beach capable units were available. The officers then requested a lifeguard to pick them up and drive them on the sand to search for the victim. Standard protocol for almost all City & County agencies is that they don’t respond into a “hot zone”, or an active crime zone until law enforcement has cleared the scene for safety. This includes City & County fire department personnel – which includes lifeguards. 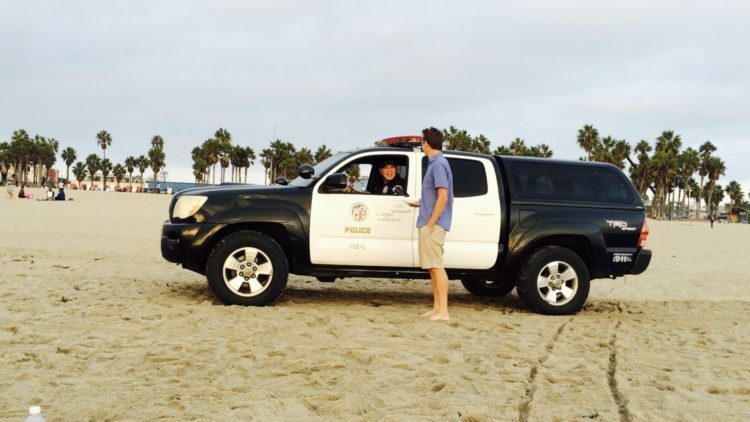 It took more than ten minutes from the time of the stabbing to get a response, and another ten to fifteen minutes before a lifeguard could arrive to pick up LAPD and drive them on the sand to look for the victim….. the victim of a stabbing that was bleeding. By the time lifeguards responded, reports were coming in about the victim walking on the sand several blocks from the crime scene by Rose and Ocean Front Walk. Over a half an hour later an ambulance was called for the victim. A half an hour – for the victim of a stabbing. My question was, why no LAPD Beach units? Several LA City and County agencies have restricted access to drive on the beach, including LA County Lifeguards, Beaches and Harbors, Recreation & Parks, LA Sanitation and LAPD. Driving on the sand requires specialized vehicles, and each agency employs training for personnel that drive vehicles on the sand. The beach has uneven terrain with varying obstacles, and just like on paved streets accidents happen. Each year, each agency reports accidents on the sand involving City and County vehicles. A few weeks ago LAPD accidentally struck a beachgoer on the sand. The victim was not seriously hurt, but the resulting video went viral. Apparently an uninformed member of the LAPD brass was questioned about the training that Beach officers receive for driving on the sand. The result of that senior command staff member, (reportedly a Deputy Chief on the oil slick out the door) not knowing the answer resulted in all LAPD Beach capable units being banned from driving on the sand until further notice. This astonished me. The ability for LAPD to respond on the sand is critical – from boats that run aground at night, to the myriad of crimes that happen on the sand, and suspects that flee towards the water in hopes of evading capture. Coupled with standard safety protocol of other agencies staying away from any crime scene until cleared by law enforcement – prohibiting LAPD from being able to drive on the sand is an astonishingly stupid move – especially as a knee-jerk, arrogant reaction of an uninformed Deputy Chief. All LAPD Beach units go through extensive training. On the sand, just as on normal roads accidents happen – but each officer assigned to the beach is trained specifically on all vehicles that are capable of driving on the sand. The summer loanees from other divisions also go through a full training not only on sand capable vehicles, but on the unique law enforcement issues specific to Venice. I had heard the drum circles the past several Sundays were out of control – and there was a stabbing at the drum circle this past Sunday. The next day – another stabbing with the victim fleeing to the sand – not to mention the weekly missing children, overdoses, and people who bring booze, weed and BBQ’s out on the sand. Those are all law enforcement issues, and don’t include the stolen property and drunks that decide to get into physical fights with lifeguards. So if you plan on enjoying the sand and our beautiful beach – hope you don’t become the victim of a crime. Despite the seriousness of the call and any level of injury – you may be in for a long wait for officers to walk out to your location on the sand.